Wastholm.com » Blog Posts Tagged "bird"
They’re not just used by behavioural scientists: a Skinner box can be a useful device for training pets, especially pets with a reasonable amount of smarts, like parrots or rats. It can automate the process you may have already used with your pet, where “correct” behaviour is rewarded – walk to heel, get a doggy snack. In the study, 10 untrained Goffin’s cockatoos faced a puzzle box showing a nut behind a transparent door secured by a series of five different interlocking devices, each one jamming the next along in the series. To retrieve the nut the birds had to first remove a pin, then a screw, then a bolt, then turn a wheel 90 degrees, and then shift a latch sideways. &sect; One bird, called Pipin, cracked the problem unassisted in less than two hours, and several others did it after being helped either by being presented with the series of locks incrementally or being allowed to watch a skilled partner doing it. Our observations prove that innovative tool-related problem-solving is within this species’ cognitive resources. As it is unknown for tools to play a major role in this species’ ecology, this strengthens the view that tool competences can originate on general physical intelligence, rather than just as problem-specific ecological solutions (see discussions in [2,4]). The precise cognitive operations underlying such innovations are still unknown, but future studies may continue to unravel them by modifying the tasks, and controlling the developmental history and pre-experimental experience across different groups of subjects. Wednesday morning, we noticed that Putte, one of our cockatoos, had a deep gash in one foot. A fairly large flap of skin was hanging loose and he had bled quite a lot. (Well, not a lot, in absolute terms — but there’s not a whole lot of blood inside a cockatoo to begin with.) Clearly the birds had gotten into one of their fights during the night even though we have put back the partitioning wall in the large cage they share. Yoko took him to the vet, who fixed him up with three stitches. This required putting him under, which is always risky in birds. Once safely home, he would of course not leave the stitches alone, and by the next morning he had already removed all visible traces of them and was bleeding again. Back to the vet he and Yoko went. 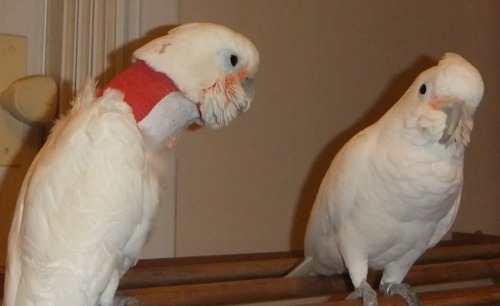 To keep him from picking at the wound on his foot, the vet set him up with a stylish collar designed to make it hard for him to reach all parts of his body with his beak. To make sure they got the size and model right, they had to keep him overnight. We got him back Friday afternoon and when I came home from work I took the photo above. He’s clearly not very happy about his new clothing style but to my surprise he has so far refrained both from trying to get the collar off and from picking at his foot. To me, he seems perfectly capable of reaching his foot — he can hold pieces of food just like normal — but maybe the collar somehow distracts him from thinking about picking at his wound. Which now seems to be healing nicely. Even before all the trips to the vet, this was already going to be a busy week. Friday (i.e., yesterday), Yoko and I had the first of three half-day sessions at the “so you’re going to be a parent” training; Wednesday night, I was taking part in a 17th century re-enactment performance, the general rehearsal of which, on Monday, I missed out on because I mostly spent that day in bed with a slight fever and a very upset stomach (something I ate, maybe). And, of course, I’m still working on two assignments in parallel. When it rains it pours. But the most important thing is that everyone is alive and well and not bleeding.